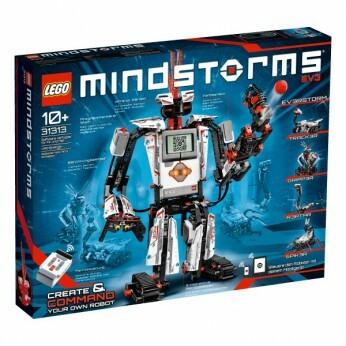 LEGO MINDSTORMS EV3 31313 create and command robots that do what you want. Unleash the creative powers of LEGO MINDSTORMS EV3 to build robots that walk, talk, think and do anything you can imagine. Begin by building one of the five cool robot characters, and control it with your smart device or the included remote control. Requires 6 x AA batteries (not included)…. Create and command amazing LEGO MINDSTORMS EV3 robots with touch sensor, color sensor (now detects up to 6 colours), infrared sensor and 550+ LEGO Technic elements.Combining the versatility of the LEGO building system with the most advanced technology LEGO ever developed, unleash the creative powers of the new LEGO MINDSTORMS EV3 set to create and command robots that walk, talk, think and do anything you can imagine. Follow the step-by-step 3D building instructions to create TRACK3R, R3PTAR, SPIK3R, EV3RSTORM and GRIPP3R and bring them to life with an easy, intuitive and icon-based programming interface. Grab the enclosed remote control and take on challenging ready-made missions or download the free app and command your robot using your smart device. This toy costs approximately £299.99 (for the latest and best prices make sure you check our retailer list for the LEGO Mindstorms EV3 31313 above). In our review of LEGO Mindstorms EV3 31313 we classed it as being suitable for ages 6 years, 7 years, 8 years, 9 years, over 10 years but recommend you check the manufacturer specific advice before purchasing.